Edition of 1389 of which 300 are signed 1-300, 26 are signed A-Z as artist's proofs, and three sets are signed as progressives. 667 copies are imprinted "Saint Hieronymus Press, P.O. Box 9431, Berkeley, California 94709." All the signed copies are so imprinted. February 9, 1985 14 colors 17-3/4" x 24"
Client: Pro Bono Publico and Charles Michael Helmken, The Shoshin Society, Suite 410, 1280 Twenty-First Street, NW, Washington, D.C. 20036. This poster was done in concert with 120 other American designers, each of whom also produced a poster, for exhibition on August 1st, 1985, at the Hiroshima Museum of Art. This exhibition coincides with the fortieth anniversary of the atomic bombing of that city. 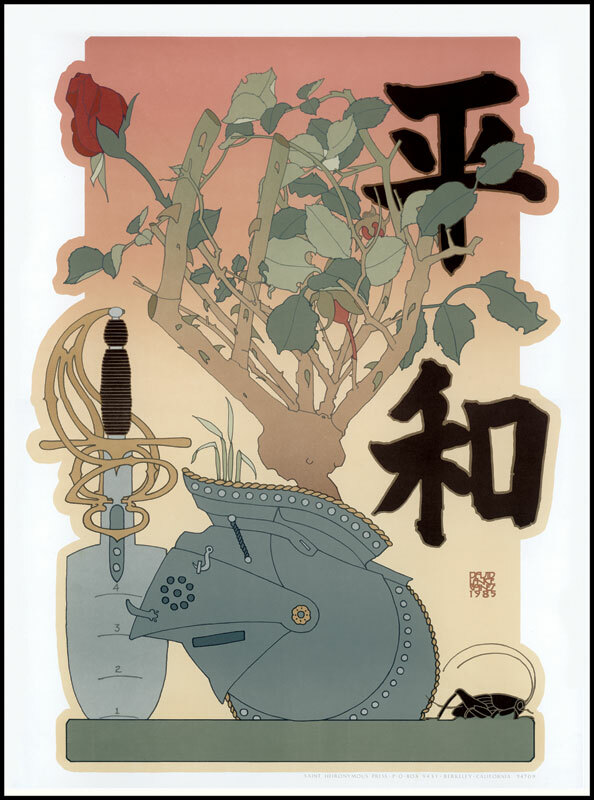 The Japanese characters are approximately translated as "No War." Swords into ploughshares and spears into pruning hooks. That's what the Good Book says, but to make an idea sparkle you need to twist things about a bit. So I hit upon the notion of helmets into flowerpots and swords into trowels. Same idea: instruments of warfare into gardening tools. The little critter at lower right is a cricket, symbol-in my mind at least-of good fortune and tranquillity. Sitting on the porch on a summer evening, you hear the crickets chirping chirps of love. You can tell what temperature it is by counting chirps and doing some fancy arithmetic thing that nobody ever can quite remember, or you can look at a thermometer which is what I do. Crickets only become silent if something disturbs them. Occasionally, for reasons best known to themselves, they take up residence in the hearth and saw away like mad, making the whole house merry. Some people thought the picture was of a cockroach, which is why I mention it. After a real war, all that would be left would be cockroaches and blackberry vines. Maybe crabgrass.